A man has been jailed for life for murdering his friend in a "drink-and-drug fuelled" attack. Steven Woolley of Sneinton in Nottingham killed father-of-two John Inger, 48, at his flat in the Carlton area of the city. 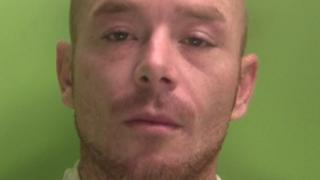 Woolley, 31, called police to say Mr Inger had been injured by someone else but later admitted the killing at Nottingham Crown Court. He was sentenced to a minimum term of 17 and a half years. The court heard Woolley had been out drinking on 25 August with a friend before they visited Mr Inger's home. An argument broke out and Woolley attacked his friend, who fled the scene, and Mr Inger. Woolley had denied murder and was due to face a trial next March, but changed his plea last Thursday. Mr Inger's children said in a statement: "The senseless and brutal murder of our dad on 26 August has left our family heartbroken. "Our dad was taken away from us far too soon as a result of a violent and unprovoked attack. "We will miss our dad every day and life will never be the same again." Det Ch Insp Rob Severn from Nottinghamshire Police said: "This was a vicious attack on the deceased influenced by a cocktail of drink and drugs. "This shows that lives are ruined by abuse of these substances."